A conservation group is seeking to eradicate rats from the unique ecosystem of a Galapagos islands using drones. These black rats have made their home on the Chagos Islands But they can also be found in the Galapagos Islands where the invaders wreak havoc on the ecosystem ISLAND CONSERVATION SOUTH AMERICAN REGIONAL DIRECTOR, KARL CAMPBELL, SAYING: "Worldwide, invasive species are one of the major drivers of extinction and for the last 500 years, they've been responsible for around 80 percent of all extinctions. As such the eradication of invasive species on islands presents a permanent solution to be able to deal with invasive species." Plants and animals have evolved in isolation for millions of years in the archipelago. Some of the species at risk from the rats include seabirds like the magnificent frigatebirds whose eggs and nestlings are eaten by the rodents. NGO Island Conservation has pioneered using drones to help eradicate the rodents from the unique habitat found on North Seymour. Using 3D printed poison applicators attached to two six-rotor drones They've delivered three tonnes of specially formulated rat poison across the island and its neighbour. DIRECTOR OF GALÁPAGOS NATIONAL PARK, JORGE CARRION, SAYING: "This innovative methodology is being used for the first time in South America. It is already being used for similar purposes in New Zealand, optimising human and economic resources." 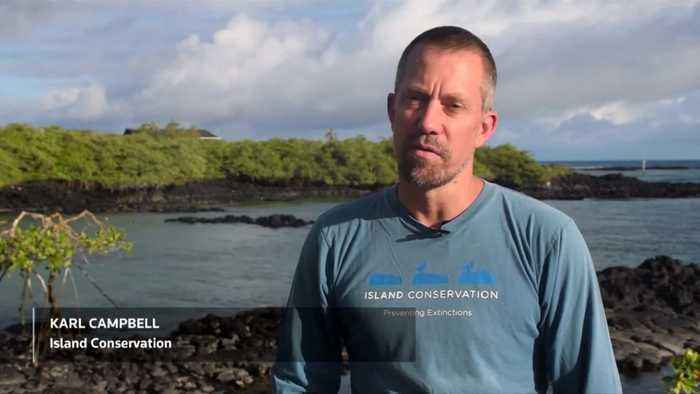 The conservation group will be able to evaluate the effectiveness of using drones - a mechanical fault grounded the drones, meaning that Galapagos park rangers distributed the rest of the poison by hand. A second application was due to be dropped by the end of January. The Galapagos national park will then monitor rat activity on the island for a further two years.